The 2008 240 Sundancer is built for comfort and luxury cruising. Don’t let her size fool you! From the swim platform to the windlass at the bow, there is plenty of space for entertaining and relaxing. The original 5.0L Mercruiser MPI w/ Bravo III outdrive had a complete overhaul and was rebuilt in 2017. Currently, the engine has only 55 hours! Owner has meticulously serviced and maintained this boat at an upscale marina. This Sundancer has been lightly used over the years, primarily to go to the beach and/or restaurant hopping. With her delightful and pristine cabin look, you’ll feel right at home. Call today for a showing! West Florida Yachts would love to guide you through a personal showing of this 24' Sea Ray 240 Sundancer 2008. 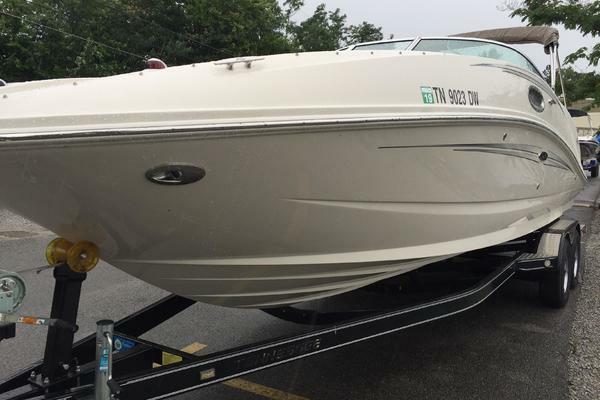 This yacht for sale is located in Lindenhurst, New York and priced at $32,000. For a showing please contact us by filling out the form on this page and we will get back to you shortly! The V-berth fills the bill as a comfortable berth at night. When you remove the filler cushion (and stow conveniently in dedicated storage), it converts to a cushy sofa for daytime relaxation. Bring out the dining table, and four can comfortably dine. There’s no lack of convenience in the galley of this cruiser. Overnighting or even extended weekend stays are possible with standards like dual voltage refrigerator, microwave, plentiful storage in cherry wood cabinets and optional stove. The large cockpit is perfect for friendly gatherings. The portside conversation area features a swing-out table with double seat and to starboard is a convenient wet bar with designated area for a carry-on cooler.